The postman only rang once. Sadiq was at home in Kabul, enjoying tea. Peeking through the window, he caught a glimpse of the postman running off. It seemed odd for the postman not say hello. “Go check on Irfan,” he told his wife, Raihana. She ran upstairs to their sleeping 3-year-old son. Just then, the front door burst open, knocked off its hinges by a gang of Taliban, faces covered, weapons drawn. When Raihana came out of their son’s room and saw Sadiq surrounded by Kalashnikov rifles aimed at his head, she fainted and fell over the balustrade to the floor below. The rest is a blur. Sadiq remembers boots fanning through the house. He could hear things crashing, men yelling and Irfan crying. The warning letters had finally caught up to them. The first kindly asked for cooperation. The second demanded information and included a “we know where you live” warning. The last threatened his life. What made Sadiq Muhammad Hakimzada a marked man was his work as a translator for the U.S. Special Forces. By the end of 2014, American troops had left Afghanistan, handing over responsibility for security and the rule of law to local Afghans. Shortly thereafter, the names of American collaborators started appearing on Taliban hit lists. It took Raihana two weeks to wake up from her coma. By then, all their possessions, including their car, were gone. Having retrieved what they needed, the Taliban warned Sadiq he would not escape their watch. Taking Raihan’s hand, Sadiq promised they would leave Afghanistan for good. The birth of their second son, Rizvan, delayed their escape by one year. But on Nov. 4, 2017, Sadiq, Raihana and their sons set off on a weeks-long trek without food or water, hiding in forests and giving the last of their money to smugglers to pack them into a small boat with 80 people bound for Greece. At dawn, they landed on the Greek island of Lesvos, picked up by Frontex, the European Border and Coast Guard Agency, and taken for processing in Camp Moria. Sadiq and Raihana were happy to be alive and on European shores, but nothing had prepared them for the realities of Moria. Nearly 7,000 miles away in Los Angeles, 26 students representing seven USC schools were given a challenge: split in teams, partner with refugees and create a solution to help people caught up in the worst humanitarian crisis since World War II. Innovation in Engineering Design for Global Challenges, offered through the Sonny Astani Department of Civil and Environmental Engineering, is the first of its kind at USC and, as of this writing, at any engineering school in the nation. It takes graduate and undergraduate students from a variety of disciplines, puts them in teams, and sends them to hotspots throughout the world to design and engineer solutions to global crises in chaotic environments. The teams have just two semesters and $6,000 each to tackle such problems as improved sanitation, shelters, electricity, mental health, education, access to information and security. The course has three instructors led by Burcin Becerik-Gerber, USC Viterbi associate professor in civil and environmental engineering. Becerik-Gerber has spent her professional life imagining an intelligent environment and laying the groundwork for smart buildings and systems that can interact with humans. As a Turkish-American, Harvard-educated scholar who has had to redefine what home means multiple times, she says she has been constantly bothered by the question, what about people who don’t have a home at all? Cracchiola, who led the team credited with building the world’s fastest racing wheelchair at the 2016 Paralympic Games in Rio de Janeiro, crushing four world records and winning seven medals, including four gold, recalls reading the expressions in the room that first day: the stunned, the expectant, the fearful and the hopeful. Cracchiola cut the pity party short: “As of this moment, you’re all engineers. The first group of 15 USC students arrived in Moria on September 15. Siena Applebaum, a mechanical engineering junior at USC Viterbi, as well as a University Trustee Scholar and a Viterbi Fellow, and Erna Redzepagic, a social entrepreneurship graduate student at the USC Marshall School of Business, were among them. “Our job was to hear what the refugees were telling us the problems were,” said Redzepagic, who grew up a refugee in Germany after she fled the war in Bosnia with her family. “What we found is shock and disbelief at the conditions people fleeing violence and war were living in,” said Applebaum who’s Turkish language skills helped her communicate with some refugees. Life in Moria, they learned, is an endless flow of queues. Eighty-five showers are shared among some 9,000 to 10,000 residents. Raihana wakes up at 5 a.m. and lines up in a two-hour queue to take a shower. Sadiq waits by to ensure she isn’t assaulted, an all-too-common occurrence in the camp. After this, he joins a queue for breakfast, which can take another two hours. By the time he brings breakfast back to the family’s tent, he must get back in line for lunch. Then there are the endless, frustrating queues of people waiting for an exit stamp on their asylum papers and a ticket to the mainland. Fights are common and can quickly devolve into riots. What’s more, tensions are rising among some locals who fear the European Union is bent on turning their island, once a popular tourist destination, into a refugee archipelago. Since the 2016 EU-Turkey Agreement, which effectively bottlenecked the flow of boats, the Greek government has confined refugees and migrants to five islands for the duration of their asylum process. Lesvos, just 6 miles from Turkey, is one of them, and it is seeing continued strain on its resources as an estimated 90 people still arrive on the island daily. The effects are both palpable and visible. In the town of Moria proper, where 67 stores once blossomed with local produce spilling out into the cobbled streets, only 14 remain open. And those are protected by cages and barbed wire. According to camp management, this was the first time a university course was granted full access to Moria. Typically, only registered NGOs and their volunteers have access. Students also met with representatives from the Moria Community Council to hear the viewpoints of the local residents affected by the crisis. To help guide the course, students were teamed up with 10 refugee global partners — young people whose education was interrupted due to conflict. They advise each team and join course sessions virtually from Germany, Norway, Spain and Greece. The United Nations High Commissioner for Refugees reported in 2018 that an unprecedented 68.5 million people around the world have been forced from home. 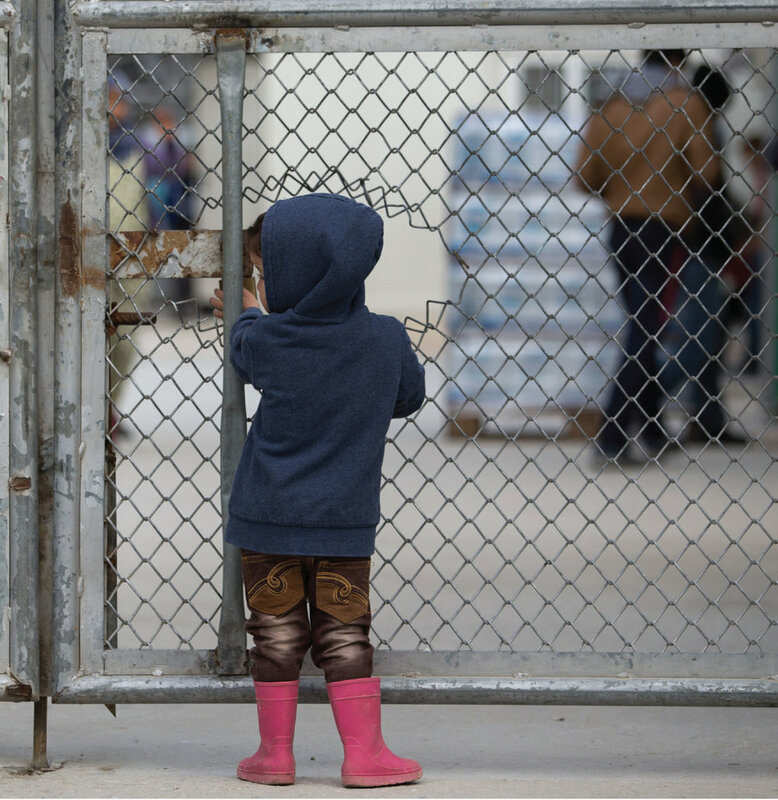 Among them are 25.4 million refugees, more than half under the age of 18. In addition to persecution and war, climate change and economic instability have added fuel to the ongoing mass migration. The course is funded in part by Provost Michael Quick’s Wicked Problems Practicum, the Min Family Engineering Social Entrepreneurship Challenge, the office of USC Viterbi’s Dean Yannis C. Yortsos, Los Angeles-based real estate developer Sonny Astani, M.S. ISE ’78, the Greater Kansas City Community Foundation, Walter Singer ’B.S. ’82, and Murat Sehidoglu, M.S. ISE, M.B.A. ’80. United Engineering Foundation is sponsoring a documentary film that follows the students as they race against the clock, and themselves, to turn their ideas into reality. Their support allowed students to return to Moria on February 5 with prototypes in hand. Led by Becerik-Gerber, Cracchiola, course coordinator Daniel Druhora and accompanied by Astani, the students spent over a week testing their prototypes inside Moria R.I.C. and Kara Tepe, officially called the Hospitality Center for Refugees and Migrants Mavrovouni (Kara Tepe). Redzepagic returned with a portable shower that can be built by refugees using readily available materials. The team struggled through several prototypes, multiple failures and roadblocks before they committed to one idea they want to implement. Before leaving, the students gave their prototype to a young family in need, namely, Sadiq and Raihana Hakimzada. “We are thankful for the help provided by USC and its students,” said Moria’s commander, Yiannis Balbakakis, who has led efforts to relieve overcrowding in the camp by transferring over 3,000 asylum seekers to the mainland since September. “We need fresh ideas, your ways of thinking about the problems we face,” he told the students. In addition to testing in the camps, teams presented their prototypes at a major pitch event on March 7 in Lesvos to officials from Greek federal and local governments; representatives of UNHCR and other major NGOs, Greek universities and local business leaders such as the Lesvos Local Development Co., ETAL S.A., which is responsible for over 100 million euros in local development projects on the island over the past 15 years. For the students, the opportunity to leverage engineering skills to help solve intractable problems is exhilarating. The instructors want to offer the course again next year and hope it becomes a model for how to train a new generation of engineers to respond to global crisis. “Through rapid iteration and through questioning their assumptions, but not only — through tangible and visceral experiences — our students are learning how important empathy is to the success of their projects,” Gerber said. As for Sadiq and Raihana, three days after the USC students left the island, they got their stamps to leave for Thessaloniki. They hope to make it from there to Washington where Raihana’s sister lives. And the portable shower? Passed on to another family awaiting their ticket. In fact, before thousands of units are manufactured and shipped to camps all over the world, they all left something behind. Team Waterway, which designed a backpack system for carrying water, left their prototype to an expecting mother in Moria. Team Duet, which is rethinking the way philanthropy is done, successfully delivered their proof of concept: a bag of diapers purchased by someone in Los Angeles for a family of refugees resettled on the island. The University of Southern California has been selected as a partner institution for Diplomacy Lab, a program of the U.S. Department of State that provides students and faculty with hands-on experience on global policy challenges. Starting this spring, USC Viterbi will serve as the central hub for this new USC-State Department partnership, which will call on faculty and their students from across campus to consider solutions for urgent issues governing international affairs. Najmedin Meshkati, professor of civil and environmental engineering, industrial and systems engineering, and international relations, is the program’s academic lead. USC’s involvement in the program is an outgrowth of Meshkati’s Engineering Diplomacy course. Meshkati, a former Jefferson Science Fellow and senior science and engineering advisor to the Office of the Science and Technology Adviser of the U.S. Secretary of State, has incorporated Diplomacy Lab challenges into his courses. One of Meshkati’s students, Stefani Mikov, B.S. ’17, an industrial and systems engineer, was a finalist in the Diplomacy Lab’s Wonk Tank competition in April 2016, presenting an innovative project to redesign Syrian refugee camps in Turkey. “This partnership recognizes our efforts to fuse an engineering thought process with foreign policy and international development,” said Meshkati, who is currently on sabbatical as a fellow with the Project on Managing the Atom at Harvard Kennedy School’s Belfer Center for Science and International Affairs. The State Department is responsible for responding to a wide array of challenges, including climate change, weapons non-proliferation, democracy and human rights, counterterrorism, global health, energy security, gender equality, economic policy, trafficking in persons, food security and conflict stabilization. Each semester, the agency releases a list of proposed projects to its 30 partner universities. Universities then identify faculty members to lead teams of students in research and innovation that address a given challenge. These teams bid on a maximum of four project proposals that align with their strengths. Once a project bid is approved, teams work in a semester-long sprint to develop a final work product that accomplishes the goals outlined by the department. The student-teams in the Innovation in Engineering Design for Global Challenges course are working on the following prototypes. Safar, which means “journey” in Farsi and Arabic, is a mobile app built that serves as an information aggregator to help guide refugees upon arrival at a refugee camp. Safar will be the first app to address location-specific refugee needs in real time. It achieves this by pulling critical information from several official sources and user feedback, then integrating this data into an easily accessible, dynamic interface, much like the Waze app does for drivers. Sol is building a portable, lightweight shower that will help refugees and others enjoy the dignity of a proper shower in an outdoor camp or hospitality centers, or inside ISO containers, reducing the shortage of shower stations and increasing privacy. Unlike existing shower solutions made for outdoor camping, Sol’s design uses a water recycling system to reduce environmental impact and improve sanitation. Amber is a clothing brand focused on making highly functional, low cost, sustainable clothing designed specifically for emergency response scenarios. Their first product, the amber thermal will provide cost effective protection from the cold, from disease, and from noise, while keeping users' essential documents safe. This can be a life-saving solution when conflict or disaster first breaks out and refugees or internally displaced people are fleeing. WaterWay is a durable, lightweight container to help people comfortably transport water over long distances. The container will include over-the- shoulder straps and weight manage- ment reinforcements to help the user carry water on their back. Offering fill and spigot simplicity, this water-back-pack can serve as a water reservoir that can be suspended from anywhere and will also have built-in filtration and purification elements. Duet is a philanthropic initiative that pairs backers and resettled refugees through specific and meaningful item-based donations. Using matching algorithms, it pairs a purchase in the United States, for example, with a product that a refugee or displaced person needs and can’t afford, but yet is readily available in a host nation. Described by its team as the “Uber of micro-philanthropy,” Duet seeks to eliminate donation waste by connecting givers to individuals’ needs.